We’d love your help. Let us know what’s wrong with this preview of Brontide by Sue McPherson. Rob; (and his brother Pen) white Aussies. Rob is completing Year 12, going to schoolies, working as an apprentice in his dad's company and loves his dog, Nig. Rob believes real men take risks. Pen; fifteen-years-old, storyteller, graffiti artiste extraordinaire with a penchant for male anatomy. Pen is liked by everyone. Pen and Benny Boy are mates. Benny Boy; twelve-years-ol Rob; (and his brother Pen) white Aussies. Rob is completing Year 12, going to schoolies, working as an apprentice in his dad's company and loves his dog, Nig. Rob believes real men take risks. Benny Boy; twelve-years-old, Aboriginal, loves drawing, fishing and living with his awesome (white) foster Nan. Benny Boy doesn't trust Rob. Jack; white, male, finishing Yr 12, new to the area, from the bush and adopted into an Aboriginal family. Jack has met Pen and reckons he's a funny bugger. He has also just signed up as an apprentice working alongside Rob-the-knob. To ask other readers questions about Brontide, please sign up. In the small town of Taralune on the Sunshine Coast, four adolescent young men reluctantly commence their stories. Acclaimed author Sue McPherson was invited to Taralune Secondary College and St Nicholas Lutheran College to participate in a storytelling workshop with adolescents. Emerging were four young men, interrelated narratives sharing their ambition, unease and lives within the small coastal town. Taralune is atmospheric and wonderfully illustrated through the perspective of each young man. In the small town of Taralune on the Sunshine Coast, four adolescent young men reluctantly commence their stories. Acclaimed author Sue McPherson was invited to Taralune Secondary College and St Nicholas Lutheran College to participate in a storytelling workshop with adolescents. Emerging were four young men, interrelated narratives sharing their ambition, unease and lives within the small coastal town. Taralune is atmospheric and wonderfully illustrated through the perspective of each young man. The Bower brothers are characters of contrasts. A sensitive and compassionate young man, respected by adults and peers while the other is perceived as ignorant, intimidating the young men of Taralune and promoting toxic masculinity. The thunder you hear miles away, that's the brontide. Seventeen year old Jack Trainer is a interesting young man in particular, his narrative captivating and characteristic of the wonderful diversity of Taralune. Unable to care for her biological son, Jack was adopted by a wonderful Indigenous extended family. I enjoyed the discussion of societal influences, Black Lives Matter and racial stereotypes. What an unexpected little gem. Told through a series of interviews this is not so much a story but a glimpse, fleeting and vulnerable, into the lives of a group of diverse Australian teenagers. The sparse, stripped back narrative style is surprisingly powerful, providing space for each individual to share their truth and their experiences, to ask questions about their lives and the world in which they live, to ponder on who they are and where they fit in society. It is surprisingly profound and at times deeply moving. In many ways it is simply a series of moments captured in time, no one person more important than the other but interconnected in the way that all our lives really are, their stories entwined but also separate and significant in isolation. Just kids being kids, blurring the line between those awkward teenage years and adulthood, dealing with the pressures of wanting to belong. It is a series of moments in which they are unashamedly themselves, flawed and truthful and absolutely real, moments in which they push boundaries and confront challenging truths and question the ways in which we perceive and interact with each other. Moments in which they make choices about who they are and who they want to be, on the impact they want to have on the lives of those around them. There is something refreshingly honest about the way this book explores concepts like racism, toxic masculinity, poverty, domestic violence, abuse and peer pressure. It is not out to make a point, it is simply a window into the lives of four typical teenage boys grappling with the legacy of a society in which these things are commonplace, in which these things impact on and shape their lives, as well as the choices that they make and the way they understand and navigate the world. This style of storytelling, told from multiple perspectives, serves as a powerful reminder to question the reasons why we judge other people, especially those who are different or don’t fit the accepted ‘norm’, because often we do not know their story. It is a reminder that while you may be the protagonist of your own life, it does not make your story more valuable or important than anyone else. Providing a fascinating glimpse into different lives over the same period of time and shaped around a profound tragedy, this is a surprisingly thought-provoking and powerful book. A story that, at its core, is filled with compassion and empathy, wry humour and a deep sense of companionship and solidarity. It is an easy read despite some confronting elements, short in length and with authentic and relatable voices rising to the fore, making it an accessible and engaging story perfect for opening a dialogue about acceptance, friendship, identity and race, as well as a reminder to question the ways in which we treat each other and how our choices and actions shape the world and people around us, both for the positive and the negative. Excellent, easily accessible book that covers some deep issues in a very engaging style. Told through a series of interviews, it was fascinating getting different view points on the same event. Proving nothing is as it seems, one should never judge, you never know the full story and that teenagers boys aren’t all that bad. I think this I was captivated from the first page and I didn’t move or put this book down until I’d finished it. Sue McPherson had the good fortune of attending Taralune High School near Noosa and interviewing kids and while this is such an obvious and easy way to produce a book, I loved it. Reminiscent of Papunya and Alison Lester's primary picture books produced through a collaboration with a school community this is the wonderful result. It is often hilarious, at times raw and mostly touching but always insightful and totally readable. This book gives us a rare first hand look into teenage lives set in a Sue McPherson had the good fortune of attending Taralune High School near Noosa and interviewing kids and while this is such an obvious and easy way to produce a book, I loved it. Reminiscent of Papunya and Alison Lester's primary picture books produced through a collaboration with a school community this is the wonderful result. It is often hilarious, at times raw and mostly touching but always insightful and totally readable. This book gives us a rare first hand look into teenage lives set in a small mixed cultural community. It will be picked up by reluctant readers who gravitate to books with this small word count format. They will find it awesome!! 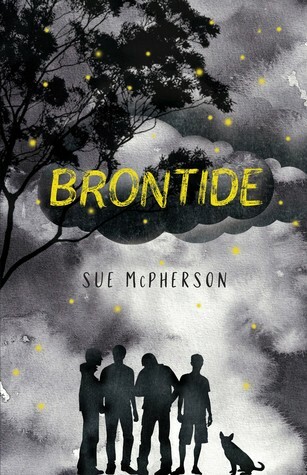 Brontide is told through a series of interviews, and share the stories of four teenage boys reluctantly participating in a storytelling workshop with author Sue McPherson. Brontide is a quick but intense read that raises social issues in a way that could easily lead to many discussions in a classroom or family without presenting clear and tidy answers. As someone who volunteers for storytelling workshops, there was a lot that was deeply familiar - the initial reluctance that turns into a determin Brontide is told through a series of interviews, and share the stories of four teenage boys reluctantly participating in a storytelling workshop with author Sue McPherson. Well this leaves you with a punch to the guts. Very accessible book (perfect for 15-18yo boys who don’t read), told in interviews to the author. This is the story of 4 boys, Rob, Pen (named because of the graffiti he leaves around town— can you guess?! ), Jack and Benny Boy and their lit in life. Excellent. A quick and surprisingly powerful novella and great example of innovative Australian YA literature. The set up is a series of interviews at a high school based on the Sunshine Coast. Our author/interviewing is indigenous as are some of the interviewees. It’s a powerful way to bring race/tolerance/coming of age/family issues to the fore. Told through a series of interviews, this heart breaking transcript deals with racism, adolescent risk taking and domestic violence ... all in a small Australian community. It's a quick read, but the ending will stay with readers for much longer than it took to turn the pages. Interesting format. Tight, restrained length. Confronting content. Authentic voices. Simple yet powerful. An Australian contemporary response to Hinton’s The Outsiders. A must read! A really interesting concept and structure, but I didn't lose myself in the story in the way I had hoped. This would be really interesting to use in a classroom. So much happens in this story! Told using transcripts of interviews with young boys in school, this is unsettling stuff! Recommended. Brontide is a coming of age story of four young boys told through a series of storytelling sessions at their school. Wow, what a unique and fascinating concept. This was young adult unlike anything else I have read. I loved this format and found it easy and engaging. The storytelling sessions of dialogue between the boys and the author made it easy for the reader to get to know the boys rather quickly despite how short the text is.This tale is full of great themes like perspective and different Brontide is a coming of age story of four young boys told through a series of storytelling sessions at their school. Wow, what a unique and fascinating concept. This was young adult unlike anything else I have read. I loved this format and found it easy and engaging. The storytelling sessions of dialogue between the boys and the author made it easy for the reader to get to know the boys rather quickly despite how short the text is. Benny Boy; fifteen-years-old, Aboriginal, loves drawing, fishing and living with his awesome (white) foster Nan. Benny Boy doesn't trust Rob. Jack; white, male, finishing Year 12, new to the area, from the bush and adopted into an Aboriginal family. Jack has met Pen and reckons he's a funny bugger. He has also just signed up as an apprentice working alongside Rob the- knob.